Eye health is something we all need to take very seriously. Whether you’ve always had perfect vision or you wear glasses or contacts, everyone needs to get an eye exam on a regular basis. Your eyesight can change at any age, and if you ignore it or are unaware of the changes, problems can worsen and the health of your eyes will suffer. Thankfully, there are some easy to identify warning signs that let you know it’s time for an eye exam. Here are 6 signs you shouldn’t ignore. 1. It’s been at least two years since your last eye exam—Experts recommend that you have your eyes checked at least every two years. This even goes for those people who have always had perfect vision (dang you!). In some cases, it’s necessary to get your eyes checked even more often. A good example of this is if you’re over the age of 40, because vision tends to change rapidly as you age. Don’t put your eye exam off any longer. It’s a critical part of maintaining your health. Schedule a full eye exam as soon as possible. 2. You have trouble focusing—Occasionally, we all deal with blurry vision or difficulty focusing. This is especially true after a long day where you put a lot of stress on your eyes. That’s not what this is about. This is for people who regularly run into trouble focusing their eyes. If you have blurry vision on a regular basis, you need to take it very seriously. Schedule an appointment to get your eyes checked out immediately. The sooner you act, the more damage you can possibly prevent. 3. You have headaches on a regular basis—If you get a lot of headaches, it could definitely be a sign of an eye health problem. You could be straining your eyes without even realizing it. That’s because our vision changes slowly over time. You may have had 20/20 vision at your last eye exam, but now you could have declining vision and not even realize it. This causes severe eye strain and headaches. Get your eyes checked to make sure this isn’t the source of your headaches. 4. Your eyes get tired easily—Again, infrequent eye strain isn’t that big of a deal. However, if you’re eyes are getting tired on a daily basis, it could be a sign of deteriorating eye health. Do your eyes hurt when you move them? Have your eyes suffered fatigue for a period of a few days? If so, you need to schedule an appointment to get your eyes examined ASAP. 5. You find yourself squinting—I’ll never forget when I first started squinting regularly in the 6th grade. Up to that point, I had passed all eye exams each year with flying colors. Then, I suddenly had to squint to read the chalkboard. It was a tell-tale sign that I needed to get my eyes checked out. Do you find yourself squinting more and more often? 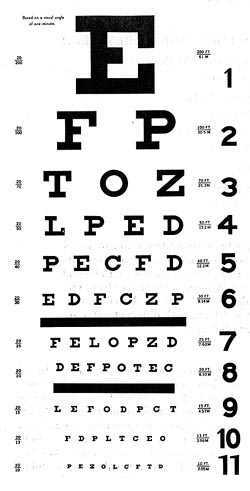 Go get your eyes checked. 6. Your frames are outdated or scratched up—Eyewear fashion is constantly changing, so if your frames are out of style, it’s probably been a while since you last had your eyes checked. You can also look at the general condition of your frames for clues. If they’re scratched up, chances are that it’s been a couple of years since you had your eyes checked and bought a new pair of glasses. When is the last time you had an eye exam? The Possibility Of Seeing Through Solid Walls! Thanks for the great info on eye exams . I get a yearly check up in my hometown of Edmonton. Thanks for helping me find the signs!